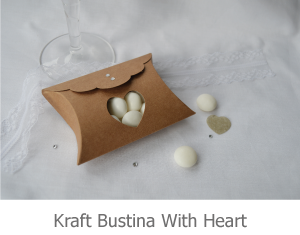 Favours Page, we create and offer pails, pouches, candles, boxes, bustina, cofannetto, laser cut boxes, kraft boxes, vintage, shabby chic, Silver Heart Weddings, favours, accessories, Huddersfield, West Yorkshire, Yorkshire, order online, gallery, hand made creations, unique designs. 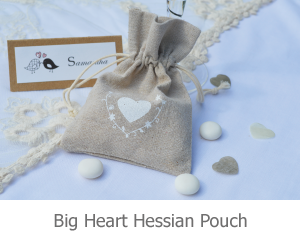 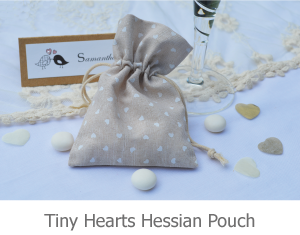 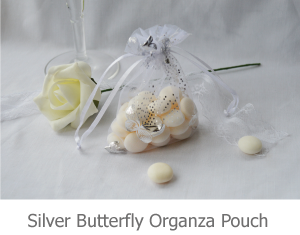 Silver Heart create a wide range of favours to thank your guests for sharing your special day. 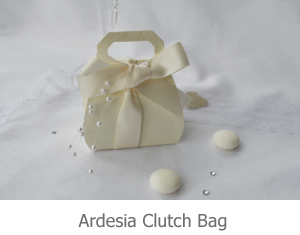 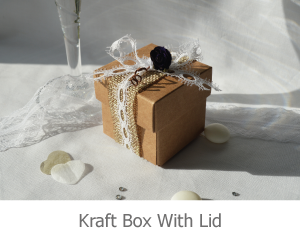 We provide a wide variety of favours from elegant pillow boxes to shabby chic kraft recycled miniature card handbags. 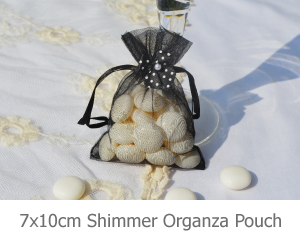 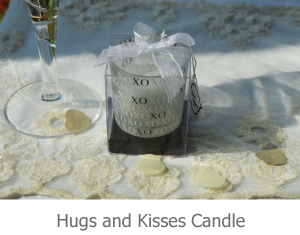 We also sell candles and organza and pouches. 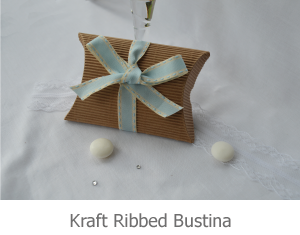 We sell DIY kits too which include ribbons, bows and other decorations as seen in the images below, in the colours of your choice. 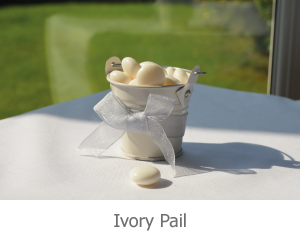 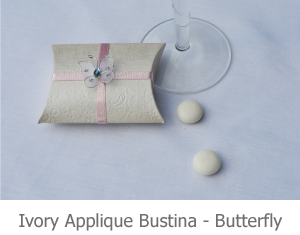 Favours are not only a delightful means of thanking your family and friends for coming to your wedding, they also make your table look fabulous, providing detail that matches the theme and colour scheme of your wedding. 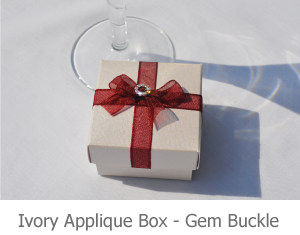 To see each favour more closely just get clicking on the images below! 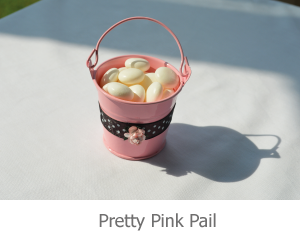 Our Pails are a cute and unique way to thank your guests. 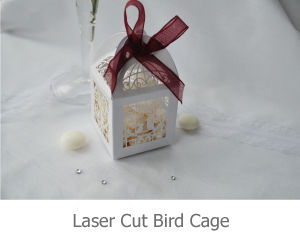 They can be purchased either plain (stacked for cheaper postage), or as a DIY kit with the accessories seen in the images below for you to attach. 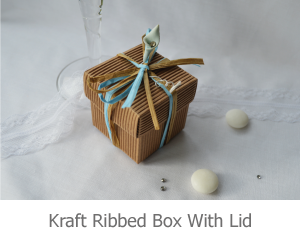 The colour schemes are also variable, if you want a different colour ribbon or rose, just let us know by contacting us on our contact form. 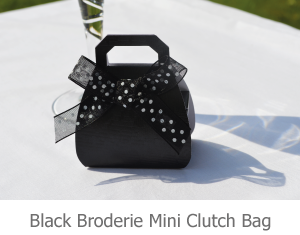 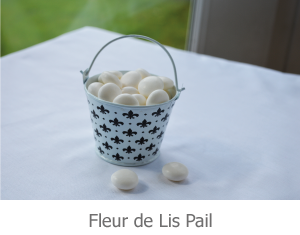 NB: Our favours are supplied empty, you can of course fill them with whatever treats you think your guests will love! 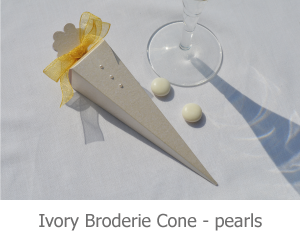 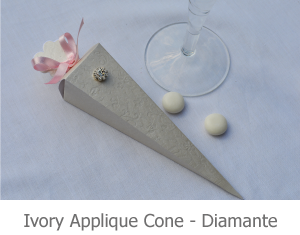 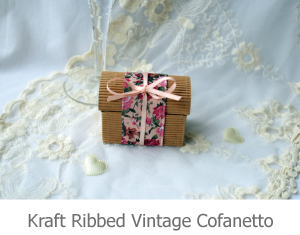 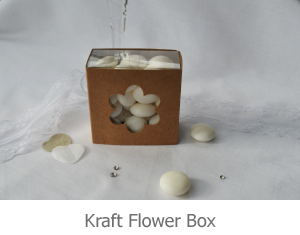 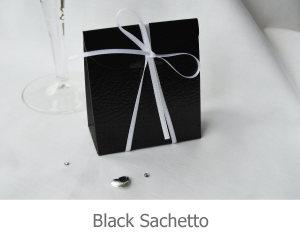 Kraft Favour boxes in smooth and ribbed card; perfect for a shabby chic or vintage wedding theme. 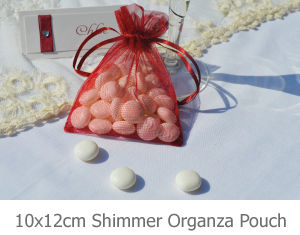 To purchase our favours please go to our ORDER FAVOURS page. 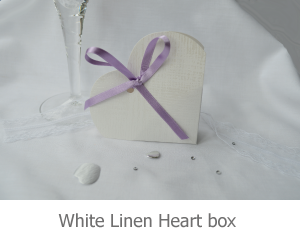 Our favour boxes are made from quality card in a variety of finishes, including Broderie and Applique textures which are slightly raised designs embossed into the surface of the card; pearlescent card which has a soft sheen; linen card which has the appearance of fabric and both smooth and ribbed Kraft card. 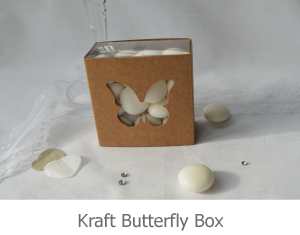 The boxes are supplied flat packed (for ease and economy of postage). 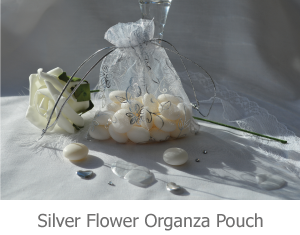 They are simple to assemble, you basically just fold them into shape. 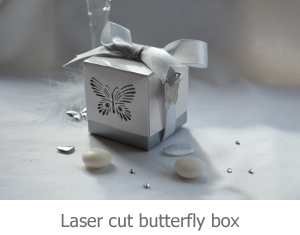 Some require glue or double sided sticky tape to fix, we recommend scor tape or double sided tape which can be bought in most stationery and craft shops. 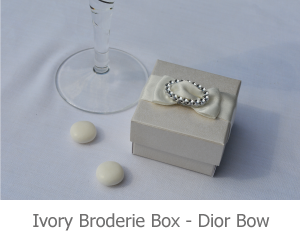 You can also purchase some of our favour boxes as a DIY kit, with the ribbons, bows and other accessories that you see in the photographs on this page. 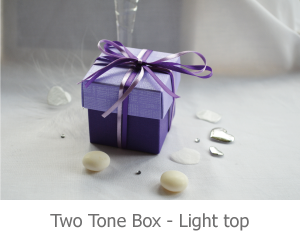 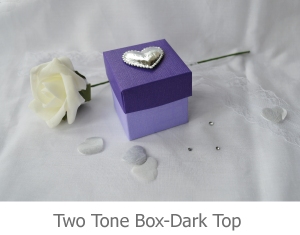 You can also order our DIY box in a different colour scheme to that shown above. 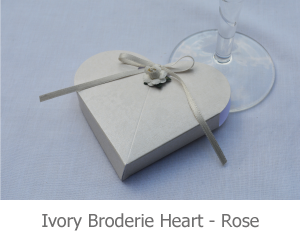 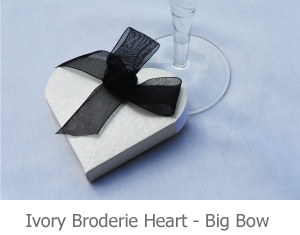 For instance if you like the Ivory Broderie Heart - Big Bow, but your colour scheme is blue, simply contact us on our ORDER DIY KITS page and we will arrange this for you.